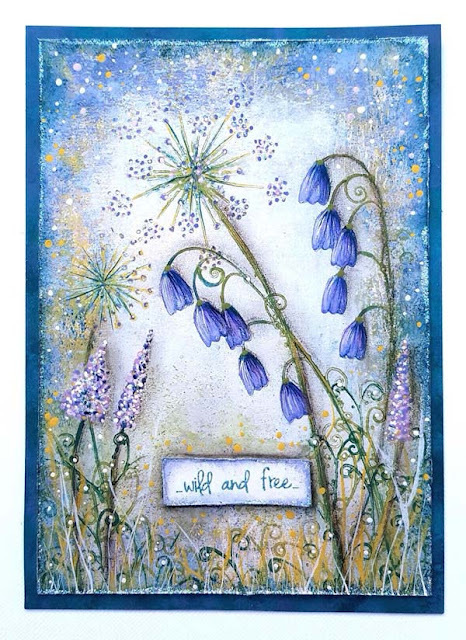 Tonight we are sharing some more beautiful new stamps by Kay Carley. 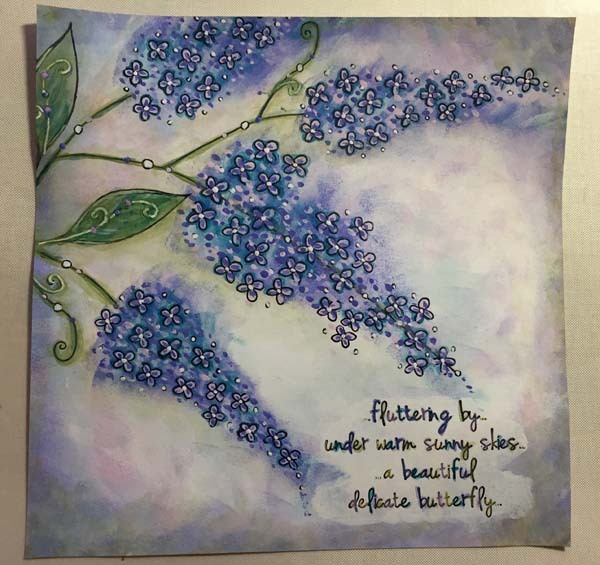 You'll find Kay's stamps are part of our Eclectica³ designer series. Kay has added more flowers for 2017, which means you in in for a Monet-inspired treat, her wildflower gardens really are a delight! 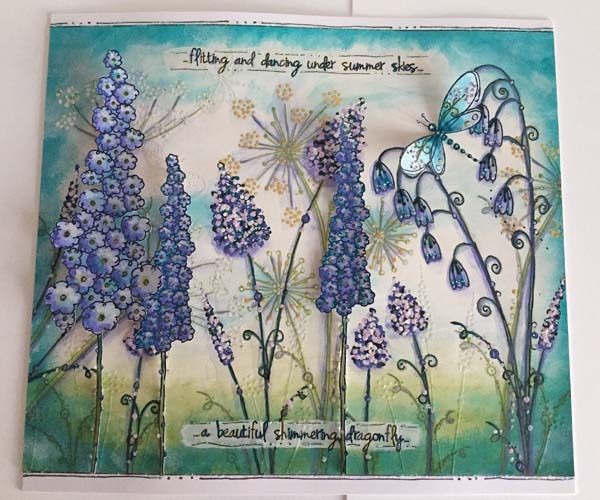 Kay started designing this time last year, (see her existing stamps here) and has a delicate, feminine touch which oozes from her creative pores so naturally! 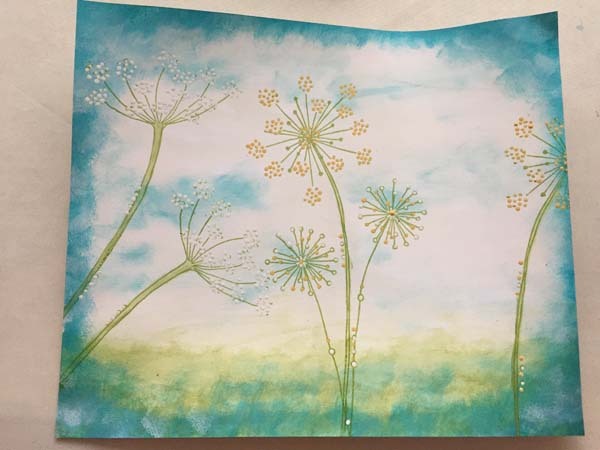 She has added more flowers to the existing collection, and you will quickly see how this allows you to make your own wildflower art. Congratulations Kay, I know your fans will be thrilled with these! Kay's designs wouldn't be right without that touch of glitter would they! I love this femimine soft style so much, and i hope you do too!! Hi everyone, Kay here thrilled to share with you my newest creations! I really wanted to add some more flower designs to my collection that would work with my existing stamp sets so with this release you will find some smaller based flowers that will sit well beneath my other sets as well as larger flowers and complementing components. You will probably notice straight away that most of my flower stamps have been drawn with straight stems! This is because (for me) I find that this provides greater versatility to a stamp. When placing the stamp onto your acrylic block you can then bend and manipulate that stem (either to the left or to the right) before inking and stamping it out thus giving you multiple choices of compositions as well as giving that one stamp a whole different look, simply by arranging the flower head to one side or bending the stem. 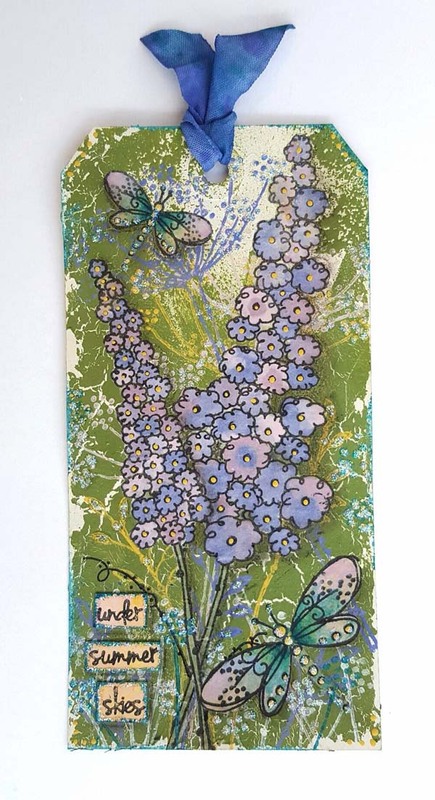 The flowers on EKC05 are based loosely on buddleia - the larger flower is based on the spiral type of buddleia that you can get but I have also provided some tiny individual flower heads so that you can fill the gaps in if you so wish or even change the shape of both flower heads by stamping more of these tiny flowers around them. Plus you can stamp multiples of these tiny flowers, cut them out and use to add dimension to the larger flower heads. On each of the stamp sets you will find some little swirly type stamps which have been designed so that they can be added to the stems of any of the flowers if you so wish although I'm sure you will think of other uses for them too! I could talk about these sets forever but I'll spare you that just now!! I really hope that you will enjoy using them and if you do please let me know and share what you create with me as I would love to see it! Tonight I invited Helen Chilton and Christine Dark to help make samples with these new products. Please go and check out their blogs where you will find more detailed information about these stunning samples and the techniques they used to create them. Well worth a visit! Let's start with Helen (blog: A Splash of Colour). 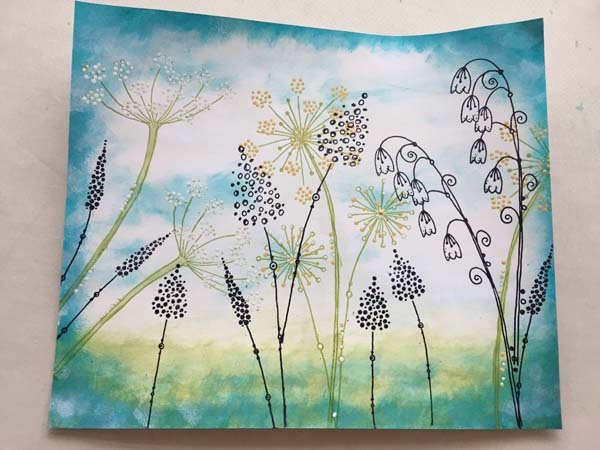 Helen is such a talented, experienced and diverse crafter and I always love how she uses and interprets the stamps when creating her artwork. She is absolutely brilliant at building up layers of depth and dimension which always becomes a feast for the eyes! Take a look below at her wonderful creations to see exactly what I mean! Helen says: This stamp set is great for building up layers and dimension with lots of different shape and size flowers. Add some sparkle to draw the eye in. 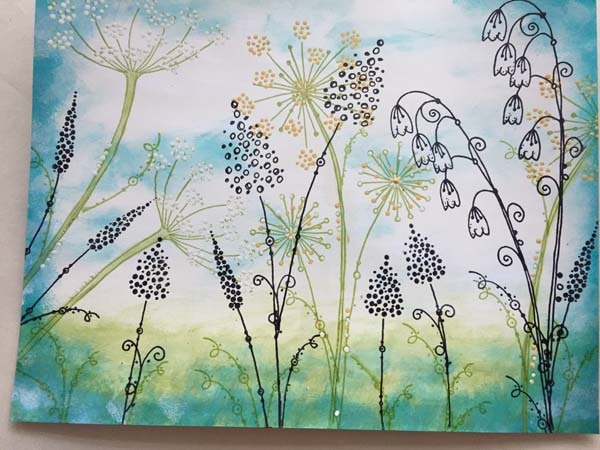 Helen: I enjoyed creating a soft focus garden by stamping in paint and then in grey. The loose flowerheads lend themselves to this effect. The tiny separate flowers on this set are great for adding to the illusion of a mist of flowers. Helen: I imagined these beautiful blooms growing up a peeling paint door or fence with glittering dragonflies hovering in between. You could also use these flowers upside down as hanging plants. Helen: This wooden heart shape was crying out for bunches of raffia tied flowers to decorate it. Make them out of paint and card and they last forever! 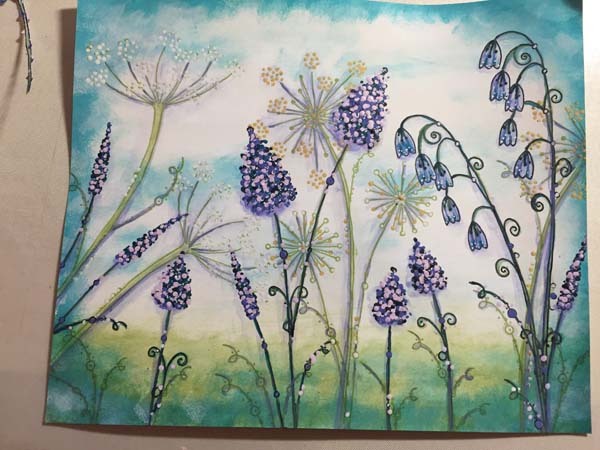 Helen: Here I've tried to create the effect of lots of movement and depth, with the bluebells hanging their heads and the other flowers growing up and out of the picture. I've concentrated on the blues and purples, echoing this in the frame. Next up we have Christine Dark (blog: Sketching Stamper). Christine is such an amazing, talented artist whom I have admired for years. I just love how Chris is able to achieve such subtle colouring within small areas. (Take a look at her sample made with EKC07 to see exactly what I mean!) Like Helen, she is also fantastic at seeing different possibilities and ways of using the stamps, which when designing I haven't even thought about! Chris: Kay's EKC05 set has flowers that immediately reminded me of the forget-me-not plants in my garden given to me by Kay's Mum so it seemed perfect to use the main floral stamps to try and recreate them. I was able to do that with the small additional single flowers included in the set which makes them so versatile and this also made it easy to stamp the flowers in different colours from the main stamped images. Chris: I was looking to create a busy summer garden feel for my tag from set EKC06 and that was managed with the aid of PaperArtsy's Crackle Glaze which for me gives a bit of fuzzy greenery for the background. 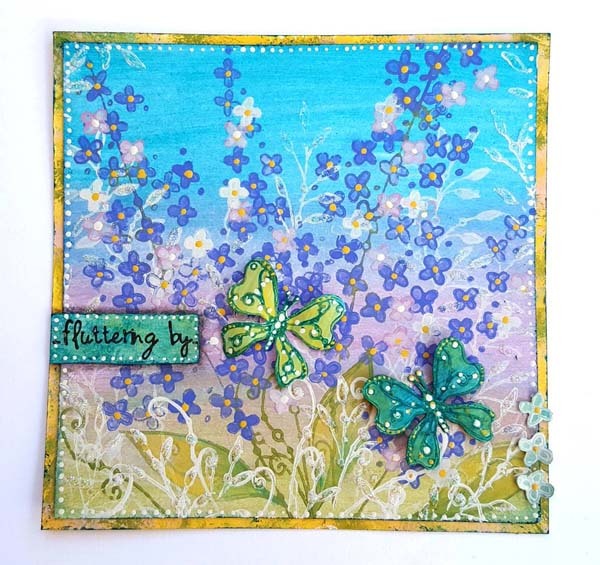 I love the pretty dragonflies and main flowers which I've stamped and painted on tissue paper so that they'd stand out over the busy background. The sentiments are great too and here I've stamped and cut one apart to create a new one for this summer garden. 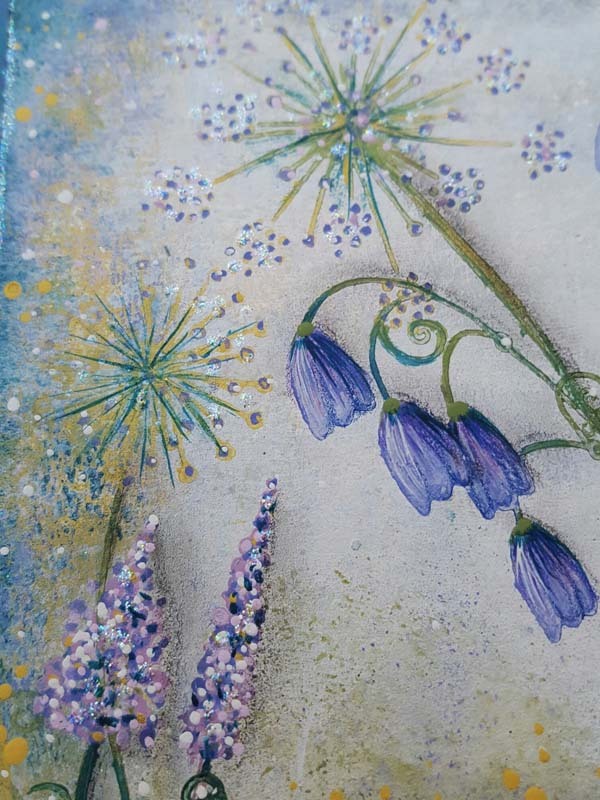 Chris: Bluebells are one of my favourite flowers so I knew I would love painting these from Kay's gorgeous EKC07 set in a more 'painterly' style using tiny brushes to achieve the light and shade in the petals. Being a woodland plant I gave the flowers a background of grasses and other flowers from the set which is easy to achieve with Kay's thoughtful designs. I've got a few step-outs with these ideas incorporating all my brand new sets. First I've made a large 18.5 x 18.5cm card turning those large flower heads into buddleia and using those extra little flower stamps to create little blossoms falling off of the flower heads although you could stamp extras of these little flowers onto spare cardstock and use them over the large flower heads to create some wonderful dimension to them! Step One: First I painted the square Smoothy panel with Chalk Fresco Finish then applied Lavender and Pixie Dust Fresco Finish paints around the edges of the panel with a sponge wedge and blended with a little more of the Chalk. 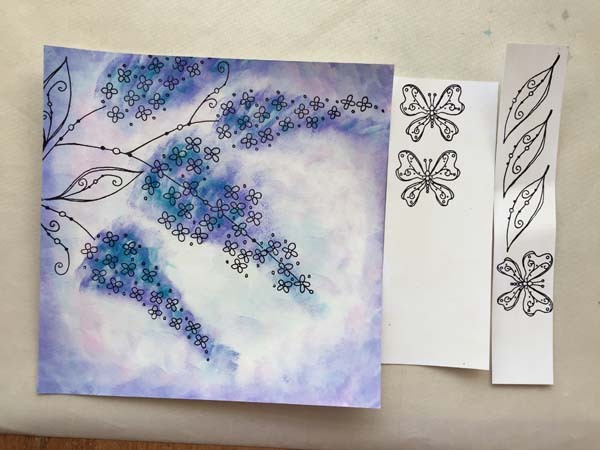 Now look at the actual flower head stamps and work out where you want to place them on your panel and create some basic 'buddleia' type flower head shapes on your panel using a sponge wedge with Lavender, Pixie Dust and South Pacific Fresco Finish paints. Step Two: Next stamp your imagery onto the panel using a Jet Black Archival inkpad and extra imagery that you want to add to the panel onto spare pieces of Smoothy card. Step Three: Paint all the imagery using Lavender, Pixie Dust, Sugar Plum, South Pacific, Haystack, Tinned Peas, Chalk and Inky Pool Fresco Finish paints. After painting all my main imagery I reassessed the panel as a whole and felt that it needed some of the Tinned Peas colour added around the flowers and edges. Then I painted a wiggly panel with Chalk Fresco Finish to stamp the wording onto and added colour to the words with the Fresco paints. 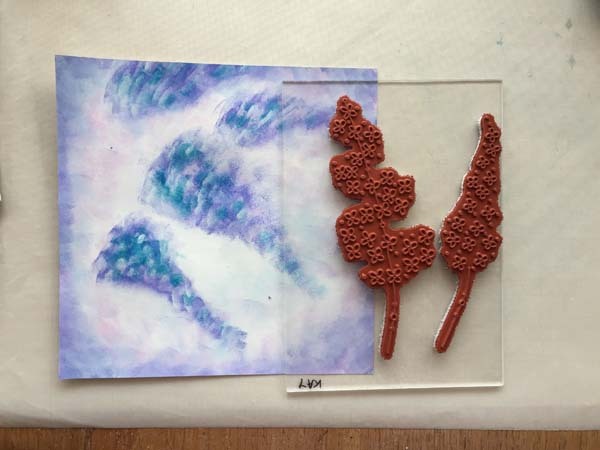 Step Four: Next it was time to add some more interest to the panel by stamping and embossing the 'spriggy' leaves and little flowers using VersaMark and Crystal embossing powder and lightly adding colour to them. 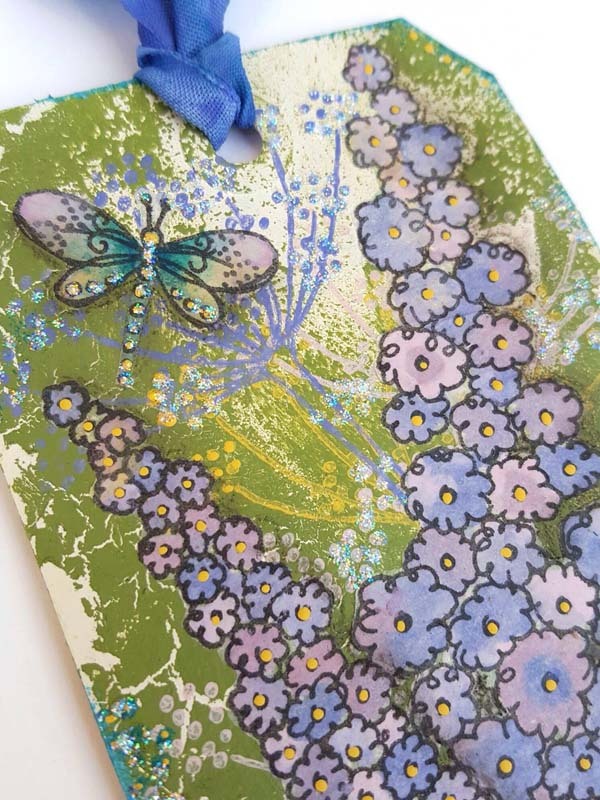 Then Pearl Glaze was added to the little flowers within the large flower heads to really catch the light before taking the VersaMark inkpad around the edge of the card and embossing with more Crystal embossing powder. 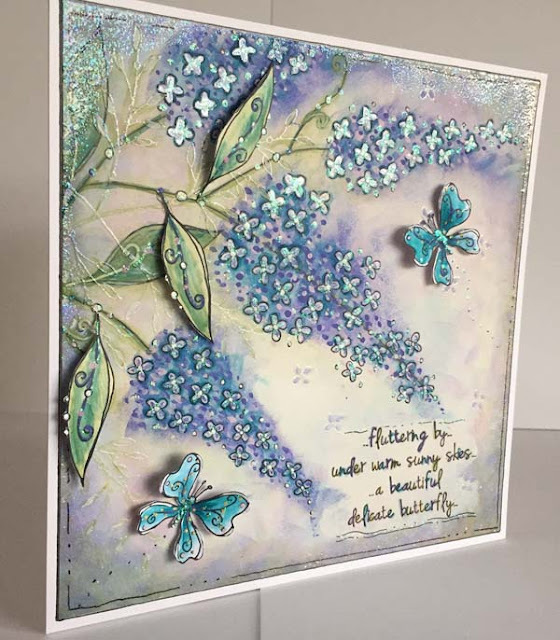 To finish add to a larger card blank, mount the extra imagery to the card with 3D pads, add a squiggly border with a black multi-liner and of course add some highlights with some Stickles Crystal glitter glue for some more sparkle! 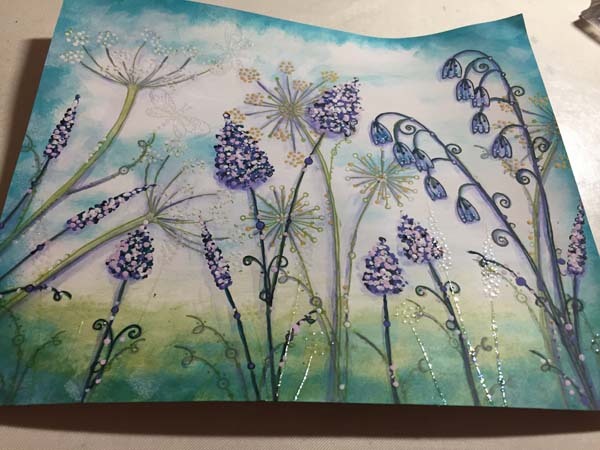 As I create anything I am always accessing as I go and you can see what a difference it makes when adding layers of interest either by stamping and embossing and mounting some extra imagery as I've done here or even by adding some stamped or stencilled layers. As this card catches the light you then see the glimmer of the Pearl Glaze, the Crystal embossing and the glitter glue which is not immediately apparent when you first look at the card - I like to do this a lot - adding little touches of things here and there!! Step One: First I painted an 18cm x 21cm Smoothy panel with Chalk Fresco Finish then sponged Tinned Peas Fresco Finish along the base of the card and South Pacific Fresco Finish around the edges taking a small amount of this into the Chalk area too. Background imagery was then added using Leaf Green Archival and lightly coloured with watered down Tinned Peas, Haystack and Chalk Fresco Finish. Step Two: Now you can add your foreground imagery using Jet Black Archival ink. The first photo below shows what I mean about bending those stems to achieve different looks with the same stamp as well as joining the flowers up to make taller ones, multi-stemmed ones etc... The second photo shows what a difference it makes adding some of those little swirly stamps to the stems of the flowers - it totally changes the look of both the stamps themselves and the composition as a whole! 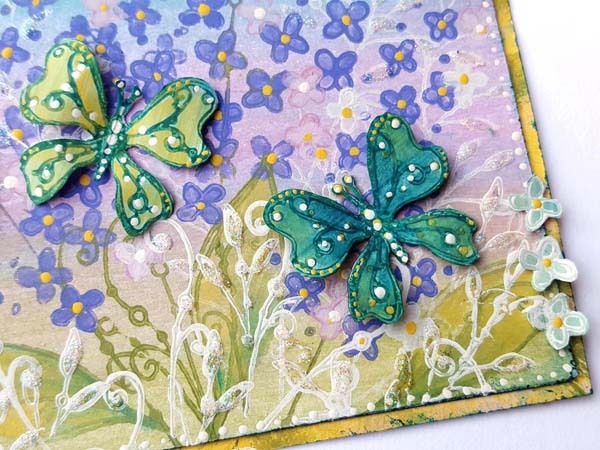 At this stage I also stamped out some extra flowers and dragonflies onto spare Smoothy card. Step Four: Next I wanted to add some shiny subtle imagery this was achieved using VersaMark and Crystal embossing powder. 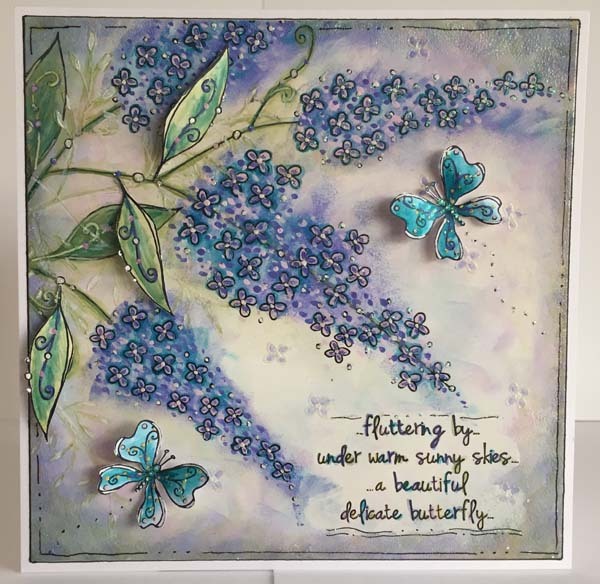 If you look closely you'll see that I did this along the base of the panel using some of the flower stamps and also into the sky area using the small dragonfly stamp. I love to add subtle highlights and interest to panels in this way - again it may not be immediately apparent when you first look at the finished card as a whole but when the light catches the card in a certain way you then notice all these little additions! Step Five: To add the words to the panel I painted some Chalk Fresco Finish wiggly strips onto the panel then stamped with Jet Black Archival ink and lightly painted the wording with watered down Fresco Finish - using colours that I'd previously used on the panel. Step Six: To finish adhere the panel to the base card, add some squiggly lines with a black multi-liner, mount extra imagery with 3D pads and add some sparkly highlights with Stickles Crystal glitter glue. Once again as the light hits the finished card from different directions you then notice that subtle crystal embossing and crystal glitter. I really hope that this has given you an indication of just how well these stamps work well together as well as showing you the versatility of them. With varying sizes of imagery it makes it so easy to create some depth to your floral compositions plus having the flowers as individual stamps allows you to both easily create larger panels as I've done here as well as smaller projects. I currently teach regularly (once every two months) at Lingfield Community Centre in Surrey on behalf of The Craft Barn - my next workshop using these some of these new stamps will be on Saturday 22nd April 2017. 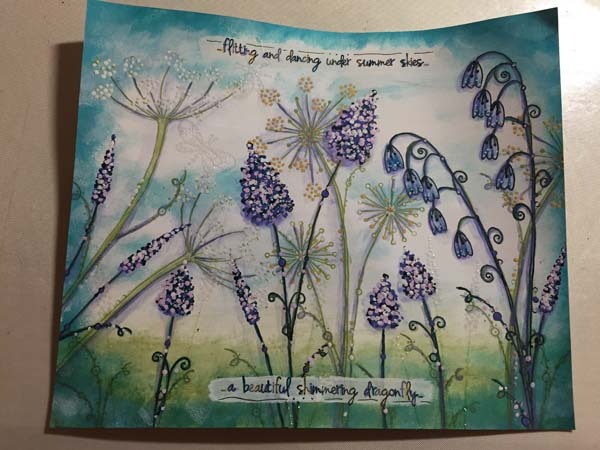 In the midst of our winter snow and cold here in the UK, Kay's stamps give us a reminder that summer is coming. The days are finally getting brighter and longer, and I am sure these stamps are going to get a lot of use in the coming months! Well done Kay they are fabulous! All tonight's wing-men, Helen and Chris have detailed step out's explaining how they made their samples on their own blogs tonight, so do drop by and take a look by following the links. Don't forget to visit and leave a comment for Kay too, it means so much to her to hear your thoughts! A wonderful release, the flowers are gorgeous, love them all! Gorgeous flower stamps and the samples made are so beautiful! Such beautiful stamps, absolutely stunning samples. May be shopping very soon! Pretty, pretty designs Kay and I love the creations you and your wingmen have made to showcase them. Really beautiful! 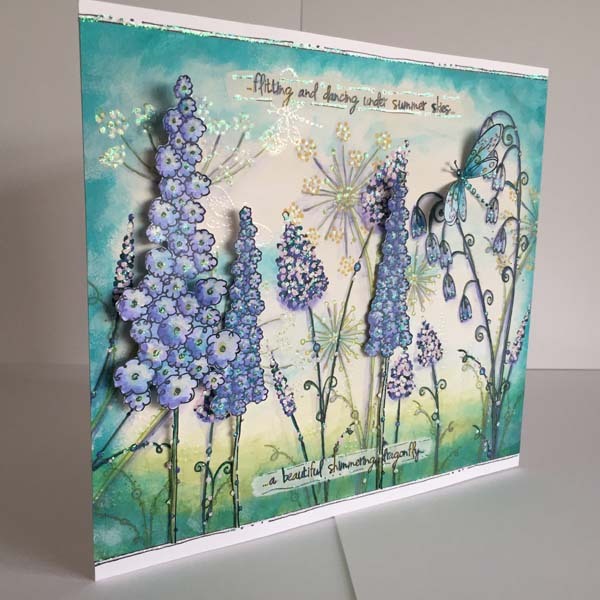 Beautiful samples from Kay, Helen & Christine, the new stamp sets are lovely.